Katie & Mike met at a 5k run sponsored by a local brewery. A mutual friend invited them to form a large group. They started talking halfway thru the race and sat for a few hours on the grass afterwards talking. Sitting there, Katie says it felt like they had known each other for years. The couple is very adventurous and loves spending a lot of time hiking, kayaking, bike riding and exploring in general. Another passion of theirs is cooking and grilling. They enjoy trying out new recipes and cooking for others. Mike had planned the proposal for months. He asked if Katie could take June 1st off of work for a special day together. When she opened the door to his townhouse she saw that he created a crime scene in his living room with different stations for her to explore. They both work in the medical field, but he knew that when she was younger she wanted to go in the FBI or CIA, hence the crime scene to solve. Katie noticed heart confetti leading up the stairs and when she opened the door, Mike was on one knee with signs in the background asking “Will you marry me?” Katie, of course, said yes! Originally, he planned for her to solve a puzzle leading to the park which held the 5k they met at, and he was going to set up the signs in a field, but Mother Nature changed those plans. Katie says it was still a perfect proposal. Later that night, they ended up meeting their parents for a celebratory dinner. One of their favorite memories was when they went on their first official date. They had planned on walking to a nearby restaurant for dinner followed with seeing a fireworks display. Mike’s townhouse is on the edge of the woods and as they walked outside, one of his neighbors told him there were deer on the other side of the embankment. Mike thought they would be able to see the deer from an upstairs bedroom, so as they walked to the door, Mike turned the handle and found it to be locked. He forgot his keys inside and didn’t have a spare key hidden outside! Before Katie arrived at his home, he went outside to fill a bird feeder and thought maybe he left the patio door unlocked. He ran in his backyard; the door was locked, and his brand new sneakers got covered in mud. His neighbor felt terrible and handed Mike a roll of paper towels to try and clean up with. They tried calling his landlord without success. They continued with their dinner plans and luckily Katie had her purse and car keys so she drove them to the fireworks. 4 hours later, Mike finally got ahold of his landlord who unlocked the door. During the whole situation, Mike kept his cool and laughed about what happened. Every once in a while, they think back to their first date and laugh about how memorable it was. Since that happened, Mike has made spare keys to avoid getting locked out again. 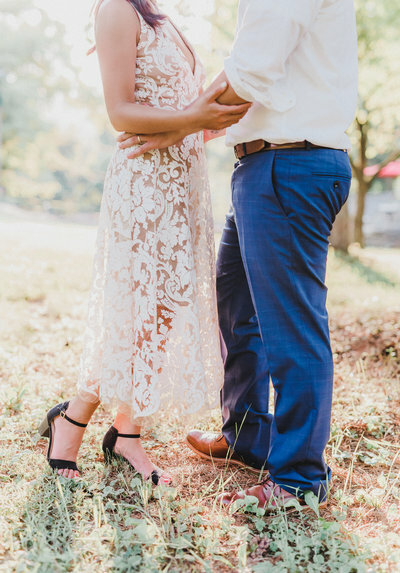 The beautiful couple will be getting married at Holy Rosary in Elysburg, PA on September 28th, 2019. They’ll be celebrating with their friends and families at the Whispering Oaks Vineyard. Their color palette of cream, petal pink, burgundy, olive green, and navy blue will be perfect shades for a fall wedding. Oh, we can’t wait to see this couple again and celebrate their love! Working with them for their engagement session was so memorable and lots of fun. We enjoyed going from place to place. They chose some really beautiful locations, as you’ll see down below. Congratulations, Katie & Mike! Thank you for the honor! Special thanks to Profile Coffee and Roasters and Rohrbach’s Farm for allowing us to use their beautiful grounds!